The Torraville Property consists of two buildings, a fishing stage and an early twentieth century bungalow. Located on the Main Tickle, once the principle transportation route for Change Islands, the property was constructed between 1900 and 1934. Walter Torraville's Stage is of aesthetic interest because of its curved roof, a rare building form in Newfoundland and Labrador. The stage was built around 1900 by the merchant Walter Torraville and used for various fisheries-related purposes until the mid-1960s when Fred Chaffey established the first freight and ferry service from the island to Cobb's Arm on New World Island and to the mainland. The old Torraville stage became the landing site at Change Islands for this ferry service. This private enterprise was a forerunner to the establishment of regular government run ferry routes in the province, a development which alleviated the isolation of many rural communities. The cottage built by Walter and Raymond Torraville is a good example of early bungalow construction in the region, a housing form that eventually gained great popularity throughout Newfoundland and Labrador. Both the stage and the cottage are unique in their curved roof design, an architectural detail once common on Change Islands but rare elsewhere in the province. In addition to the stage, Walter Torraville's Cottage also has a curved roof. The Torraville Property is an important component of our cultural landscape. It is connected to a time when life was intrinsically linked to and dictated by the sea. The stage originally served a central role in the economy of the community and later provided a vital link between Change Islands and the mainland, a link that had an impact on the islands' culture and economy, as easier access to larger communities and services became available on a daily basis. The Torraville Property was purchased by Stages and Stores Incorporated and has undergone major improvements. 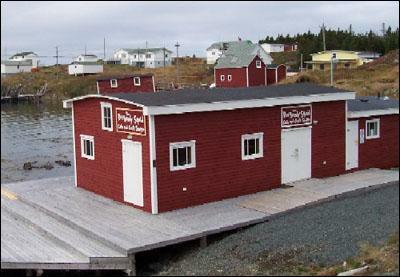 The Torraville Stage was restored as part of the Heritage Foundation of Newfoundland and Labrador's Fisheries Heritage Preservation Program and is now a café and crafts store. The Torraville Cottage has been returned to its original condition and is presently operated as a guest home. 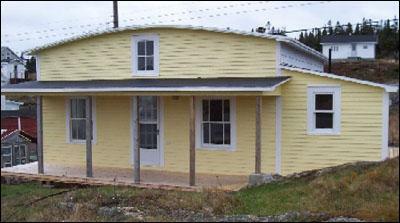 The Torraville Property was declared a Registered Heritage Structure by the Heritage Foundation of Newfoundland and Labrador in May 2004. Also view Walter Torraville's Stage Registered Heritage Structure, and Walter Torraville's Stage (Fisheries Heritage Preservation Program) on the Heritage Foundation of Newfoundland and Labrador web site. The Newfoundland and Labrador Heritage Web Site has on its site only a portion of the registered heritage structures in Newfoundland and Labrador. To view a complete list or search for a particular structure visit the Heritage Foundation's Property Search page.